This is a great fundraiser for the Golden Bear Foundation and an amazing opportunity for families of TVHS grads. 5 VIP parking spots -- reserved for you and your friends and relatives. Seating for 20 people -- in our private "Skybox" overlooking the stadium. Enjoy the large suite and balcony with unrestricted views of the ceremony below. Not only is this auction an incredible value and VIP experience, funds raised benefit the student body of Temecula Valley High School. The Golden Bear Foundation supports "parent support groups" (aka "boosters") across the campus as well as raises funds for several scholarships and grants each year. With seating for 20, this is a fun opportunity to team up with your friends, families, and loved ones. Get together with a few other families and submit your bid! View our auction at 32Auctions.com. We also have a limited supply of on-the-field seats PLUS reserved parking to sell in packages of four. 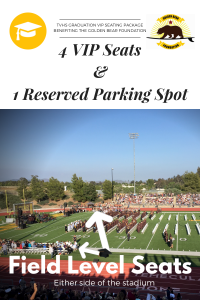 Why arrive hours early just to get a parking spot, stand in line for an eternity, and hope for a decent view of your graduate when you can support a good cause, get a reserved parking spot, and get 4 VIP seats on the field for one incredible price? VIP tickets go on sale April 15, 2019 at 32Auctions.com.